Madrid-based elandroidelibre.com (“the free Android”) is a Spanish-language blog that features news, reviews, games and other apps for Android smartphone users. Launched in 2009, it now employs six people and receives 6.5 million visits each month. Administrator and editor Paolo Álvarez got started with AdSense right from the start, which has accounted for around 40 percent of the site’s income. “Much of elandroidelibre’s growth is due to AdSense,” Paolo says. “We regard it as an essential tool that’s helping us to set up more blogs, take on more staff, and earn more revenue.” So far, he’s been highly satisfied with the ads appearing on his site, and notes that the 300 x 250 Medium Rectangle and the 728 x 90 Leaderboard formats work particularly well. Paolo also uses other Google products to manage the site. He relies on Analytics to gain a better understanding of the site’s visitors, and also DoubleClick for Publishers, Google’s free ad serving solution, to manage his online advertising more effectively and segment traffic from different countries. Hear more from Paolo in the full case study. We’ll see you next week for our next ‘10 for 10’ publisher success story as we continue counting down to AdSense’s 10th anniversary. is: if you wouldn’t want to share this content at a family dinner or view it in your boss’s office, you shouldn’t place AdSense code on it. Still have questions? Don’t forget that we’ll be hosting a number of Hangouts on Air as part of our policy refreshers series. Check the schedule below to sign up for our Hangout on Air about adult content. For our next installment of our policy refresher series, we’re talking about a topic we’re frequently asked about...adult content and keeping AdSense family-safe. 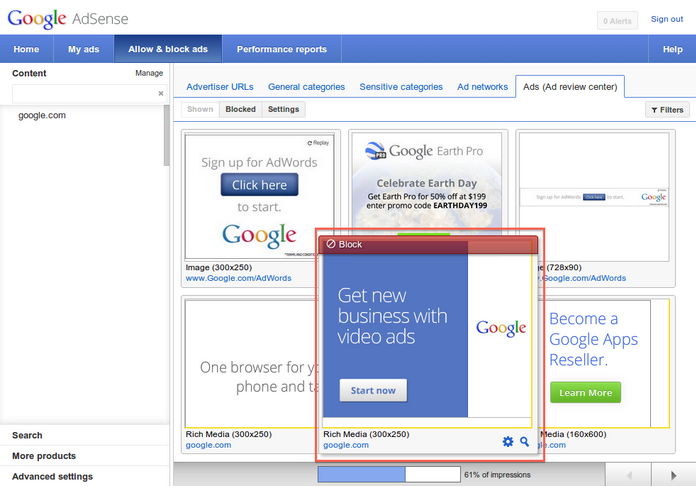 We’ve made a commitment to our users, advertisers and publishers to keep the AdSense network family-safe. A general rule of thumb when it comes to the adult content policy is: if you wouldn’t want to share this content at a family dinner or view it in your boss’s office, you shouldn’t place AdSense code on it. For more details and to find the specific code snippets related to the bullets above, visit our updated Help Center article. Even with this new flexibility, it’s important to proceed with caution to ensure the ecosystem remains balanced for publishers, users and advertisers. Please note that publishers must not make modifications to the AdSense code if those modifications are not permitted by our program policies. Publishers should always use caution when modifying the AdSense code and must not use techniques like hiding ad units, implementing the AdSense code in a way that covers content, creating ‘floating ads’, or manipulating ad targeting as they are a violation of our policies. More information about these types of prohibited techniques can be found in our updated Help Center article. In addition, please be aware that some types of code modification may prevent ads from appearing correctly, which may negatively impact your revenue. We also look forward to hearing your feedback and suggestions on our AdSense +page.
. 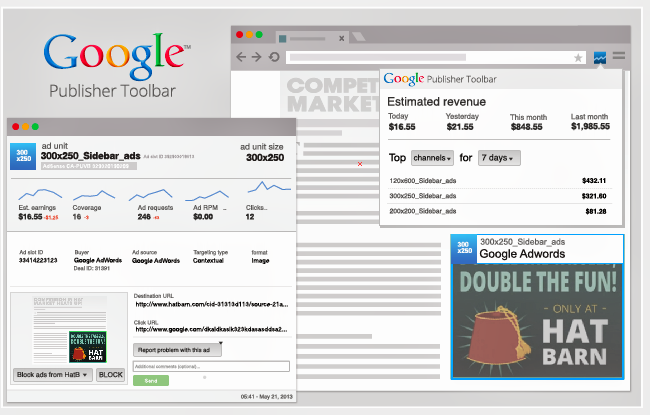 The Toolbar is a Chrome extension that gives you up-to-date information on your AdSense account such as earnings and performance and access to ad overlays that offer reporting and blocking controls directly on your site. We’ve spent a lot of time looking at ways to further enhance this tool to give you richer functionality and more control over the ads displayed on your site. Today, with your feedback, we’re happy to share the revamped Google Publisher Toolbar. The Google Publisher Toolbar will continue to include the same popular functionality as before in addition to a new feedback mechanism and blocking capabilities. As always, please be assured that clicking the ad overlays generated by the toolbar is permitted, and won’t generate any invalid clicks. If you haven’t already installed the Toolbar, you can download it from the Chrome Web Store. If you’re already using the Toolbar, no action is needed on your part as it’ll automatically update with the revamped version. 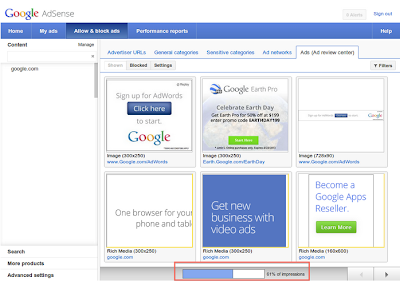 Tell us what you think of the revamped Toolbar on our AdSense +page. Over 234,000 of you have installed the Google Publisher Toolbar since it launched early last year. 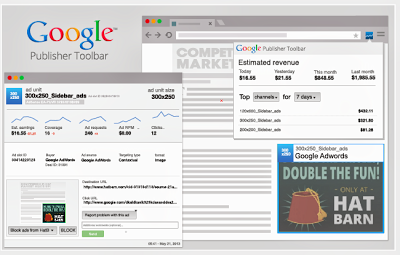 The Toolbar is a Chrome extension that gives you up-to-date information on your AdSense account such as earnings and performance and access to ad overlays that offer reporting and blocking controls directly on your site. Check the schedule below to sign up for our Hangouts on Air, and look out for more blog posts on AdSense policies in the coming weeks. In order to help you better understand our policies, we’ll be holding a series of policy refreshers online in the coming weeks. We’ll discuss the policies we’re asked about most, explain how we enforce them and share tips on how to stay compliant. After finding few sites devoted to expats around the world, in 2005 Julien Faliu decided to launch a community platform for that audience. An expat himself, Julien has since grown his site into a company based in Mauritius that now employs 15 members of staff. Expat blog receives 12 million pageviews per month and is now available in four languages. Beyond AdSense, Julien also uses a number of other Google tools to continue developing his business. For instance, Analytics enables him to view his site’s growth, and DoubleClick for Publishers (DFP) Small Business helps him manage all of the advertising on the site. What’s next for Expat blog? Julien and his team are currently developing a strategy to monetize their mobile site, and looking towards bringing private investors on board to fund the next stage of growth. For more details about Julien’s success with Expat blog, be sure to read the full story. We’ll be back again next Tuesday to introduce you to another AdSense publisher. Vietnam is one of the fastest growing online markets in the world, with huge potential ahead. The online landscape has evolved rapidly in the last few years, becoming as vibrant and colorful as the streets of Hanoi. We hope that introducing Vietnamese language support will help fuel even more great quality content creation, while helping advertisers reach out to a booming online user base through display ads. Please start by familiarizing yourself with the AdSense program policies. Need a refresher? Update your understanding of the policies by taking this AdSense policy quiz. Sign up for an Adsense account by enrolling your Vietnamese language website. Once your AdSense account has been approved, congratulations, simply add the AdSense code to your site to start displaying relevant, contextually targeted ads. Chào mừng đến với chương trình adsense! The Google AdSense team is pleased to announce the official launch of Vietnamese language support for AdSense for content. at the end of each month currently reflect the amount you've earned less any deductions for invalid activity. This is a step we’ve always taken to ensure advertisers are not charged for such activity. Until now, however, clicks and impressions associated with this activity still appeared in AdSense performance reports. Starting May 1st, we'll remove those associated clicks and impressions to address this discrepancy and provide you with the most accurate reporting. As a reminder, we encourage you to keep up to date on ways that you can monitor your website for such activity – we have a lot of resources in our Help Center covering this topic. Finally, note that reports for dates prior to May 1st will be unaffected. We know many of our publishers use multiple Google products on a regular basis, and one of our top priorities is to ensure that each interaction across our products provides a seamless experience. To better align the way we report performance across all of our publisher products and ensure accuracy, we’re updating the way certain data is shown in AdSense accounts. As you may know, your earnings at the end of each month currently reflect the amount you've earned less any deductions for invalid activity. This is a step we’ve always taken to ensure advertisers are not charged for such activity. Until now, however, clicks and impressions associated with this activity still appeared in AdSense performance reports. Starting May 1st, we'll remove those associated clicks and impressions to address this discrepancy and provide you with the most accurate reporting.